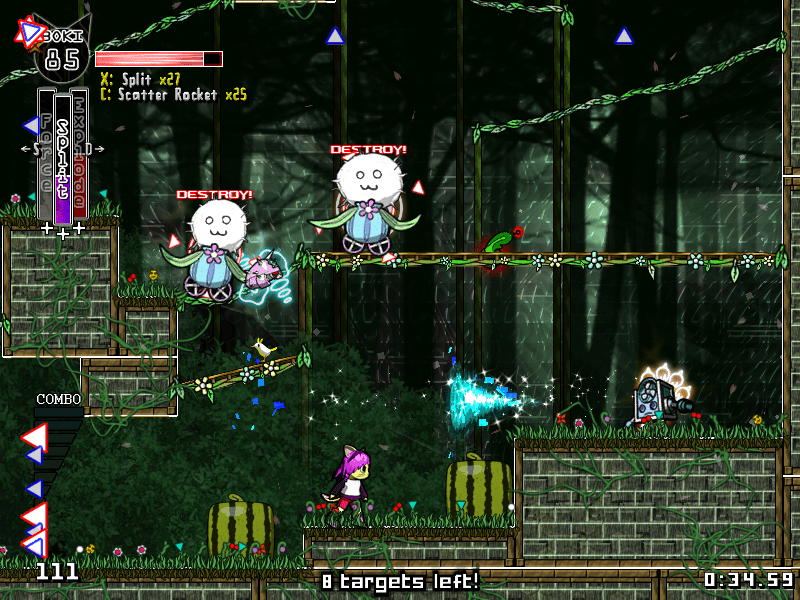 Copy Kitty is a platformer/run and gun game developed by Nuclear Strawberry and published by Degica. The protagonist of this game is some cat-like creature with the rather unique ability to copy other people’s powers. She feels like this isn’t all that special, but through her mentor manages to discover it’s actually quite special. There really isn’t much story here. The game takes place in some kinda cyberspace training facility, and you’re training to be a superhero. If you want to check out our preview of the early access build of the game, you can click here. The only big differences I can see between the game then and the game now is just more content. Overall gameplay seems pretty much the same, though perhaps more fine tuned. The main draw of this game is how many different weapons you can get, and how they can be combined. Defeated enemies sometimes drop weapons, and you can pick up three at a time. Some examples of these are shots that can go through walls, shots that explode when they hit something, or shots that shoot out a wide burst. There really are more abilities in this game than I can count, so I won’t list them all. You can fire a single weapon type, or you can use them all at once for an attack that combines traits of each weapon you have. The biggest appeal of this game kinda ends up being it’s biggest downfall though. When you get three weapon types, the combined attack ends up typically being so strong, it just wipes out everything in its wake. I suppose that kind of thing has it’s own appeal, but it can get fairly repetitive. It almost doesn’t matter what weapons you even get, once you get three of them, you can basically melt any enemy in front of you. Where I feel the game shines are when it limits what weapons you can get. Some levels only have you using one weapon. Certain weapons have additional affects other than just doing damage. For example, shooting some weapons into lava causes a geyser of lava to shoot out. With these levels, you can’t just blast through everything with something overpowered. You need to figure out the nuances of the one weapon you have. With every new stage, you start out with no weapons, or only one, so nothing transfers from one level to the next. 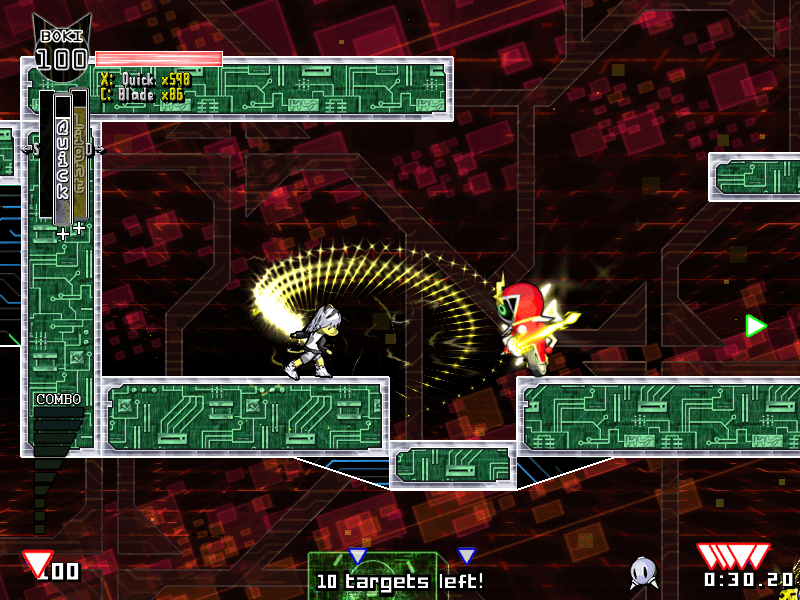 Outside of these levels, the level and enemy design leaves a bit to be desired. Levels are generally fairly open and enemies all move around and do their own thing. Most enemies are simply fodder for you to kill. Despite most levels being open, they’re also very small, meaning they generally don’t have anything clever going on. Level obstacles are standard things like spike pits, which need to be avoided. The boss fights are better than the normal levels at least. One cool thing about some of them is you obtain their weapon halfway through the fight, and can use it to defeat them. You unfortunately can’t keep it, though. There is another playable character in this game, which turns the game into almost a puzzle game. He can combine only two weapons together, but each combination has some very specific effects. For example, you might need to use a combination that allows bullets to bounce off of walls to hit a switch. Or a combination that will cause an explosion. 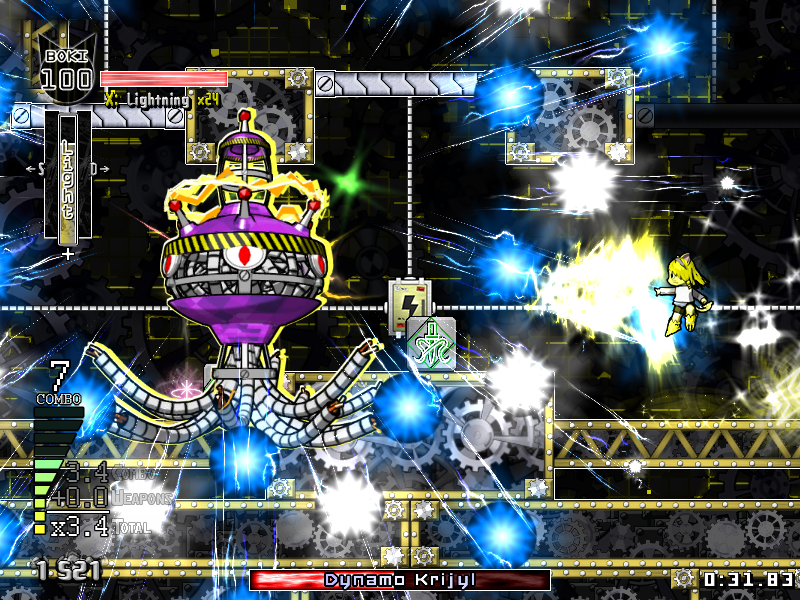 These effects have to be used in order to take out enemies and also progress through each level. I found it to be a little bit more interesting, though some of the solutions don’t always feel intuitive. Visually, the game looks nice enough with some simple 2D art. My only real qualm here is that there are normally so many particle effects on the screen, I actually had a hard time keeping track of things. You can reduce this in the game options though, which helps. Also the game runs in a 4:3 resolution, which was a bit odd to me. I felt more than once that some additional screen real estate would have been nice, but it’s not a deal breaker. The music is also serviceable too, with some electro sounding tunes accompanying the cyberspace aesthetic. No major problems as far as presentation goes, and no problems with the game running on my computer and recognizing my controller. Overall, I don’t know if this game really has much to offer outside of seeing big weapons just mow down enemies. There is the other character you can play as, but the star of the show is clearly the main character. It’s fun for awhile, but the repetitive nature and the lack of a compelling story means it runs out of steam fairly quickly. I got a few hours of enjoyment out of it, though I don’t think I can personally recommend it. Still, it’s only $15, so that might be worth it for some folks.